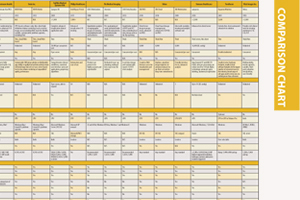 This article appeared as an introduction to a Comparison Chart on Ultrasound Systems in the November/December 2013 issue. Physicians have been utilizing conventional ultrasound, also known as b-mode ultrasound, for diagnostic imaging since the 1970s. However, over the past 10 years there have been significant technological improvements within the equipment, as well as development of new technologies that allowed ultrasound to become more widely adopted. Ultrasound equipment has gotten physically smaller, generates less heat and has become more power efficient. These upgrades, along with vast enhancements in image quality, have pushed ultrasound into the point-of-care setting. Point-of-care ultrasound has become widely performed in emergency rooms, PCP offices and obstetric practices. As healthcare reform continues to favor the use of more cost-effective solutions, this trend is expected to persist until ultrasound is used in every doctor’s office. Access the most current version of the Ultrasound Systems Comparison Chart (www.itnonline.com/content/ultrasound-systems). This will require a login, but it is free and only takes a minute to complete the form. Due in part to these image-quality improvements, ultrasound is now being used in interventional procedures generally dominated by computed tomography (CT) and magnetic resonance imaging (MRI). And although many interventional physicians still rely on CT and MRI for lung procedures, it has become common for interventionalists to use ultrasound instead of CT for image-guided biopsies and ablations. Volumetric ultrasound has also continued to improve. Ultrasound was previously only able to capture a single imaging plane, but today it can acquire volumes. “Transducers that allow for the acquisition of real-time volumes of tissue allow us to image in multiple planes — for example, the transverse and sagittal dimensions — simultaneously,” Samir said. While volumetric ultrasound has been in development for many years, the transducers have only been available for conventional use for the last few years. And because volumetric ultrasound allows physicians to characterize tissue better than before and perform conventional procedures with much greater accuracy, this area of ultrasound will continue to grow. Newer technologies are set to revolutionize ultrasound practice. One such technology is sonoelastography, a technique that has been in development for almost two decades. Sonoelastography utilizes the same machine that does b-mode ultrasound to measure tissue stiffness. It measures the mechanical characteristics of tissues and then displays those mechanical characteristics overlaid on the conventional b-mode ultrasound image. By giving physicians the ability to see stiffer and softer areas inside of the tissue, sonoelastography will aid in liver fibrosis staging, thyroid nodule, lymph node and indeterminate breast lump characterization, and the detection of prostate cancer, all of which cannot be done with conventional ultrasound. Elastography has been available in Europe for some time and systems in the United States started receiving U.S. Food and Drug Administration (FDA) approval over the past year. Another recent development is the use of ultrasound contrast agents. Contrast-enhanced ultrasound (CEUS) has been available in Canada, Australia, China and Europe for a number of years, but has not been available in the United States outside of echocardiography. CEUS grants much more sensitivity for the detection of tumors, allowing ultrasound use to expand into many of the functions currently performed by CT and MRI. Healthcare reform and other legislation is playing a big role in the widespread adoption of ultrasound. This can be seen in the legislation that many states have passed requiring radiologists to tell women if they have dense breasts, and to inform them of the benefits of supplemental screening. Overall, healthcare reform is moving toward utilizing the most cost-effective solution — a practice that is already utilized in many countries around the world. With ultrasound typically costing less than CT and MRI, healthcare reform is likely to favor the more widespread adoption of ultrasound, especially as it moves into areas where CT and MRI is currently used. “With the whole dose issue and reimbursement where the government doesn’t pay more to use multi-million dollar equipment and tie it up for 40 minutes, why not do ultrasound for a fifth of the price and get even better outcomes?” Hasegawa concluded.